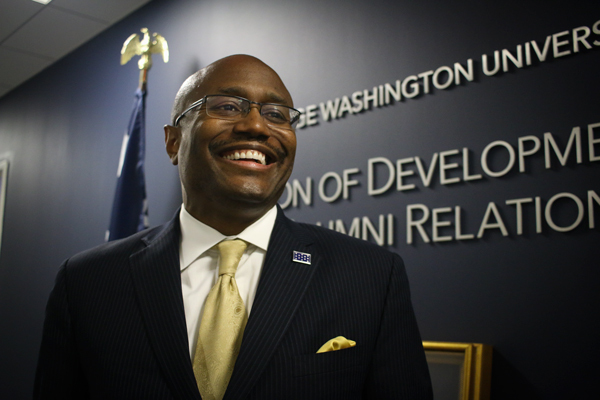 Aristide Collins, the vice president for development and alumni relations, will lead the presidential transition team. Hatchet file photo. Updated: Oct. 10, 2016 at 11:55 p.m. The University’s central fundraising office is seeking to fill 13 positions – some of which are consolidations of former positions. This hiring burst comes just a year and a half before the end of the University’s largest-ever fundraising campaign. Experts say staffing up could help officials reach their $1 billion goal and continue strong fundraising after the campaign ends. Aristide Collins, the vice president of development and alumni relations, said filling these positions is a priority for the office as they head into the last phase of the campaign. Since the $1 billion campaign began in 2011, hiring trends in the development office have varied, reaching 10 new job openings in one month in June 2015. The number of staff members working directly on the campaign remained at about 17 employees for much of 2014 through 2016, according to the campaign’s website. Most of these staffers work in the University’s main development office, which functions as the center for University fundraising and alumni relations. But employees in the individual schools provide support for school-specific fundraising, and those offices house anywhere from four to 24 employees. The new positions fill out the fundraising offices in athletics, the Columbian College of Arts and Sciences, the Milken Institute School of Public Health, the School of Engineering and Applied Science and the School of Business, along with the University’s central development office. Filling one of the open positions, the associate director of student alumni programs, could assist officials’ goal to improve alumni relationships with current students and increase alumni donations. Several development officers work on programs to increase interactions between students and alumni – like Campus to Career Dinners and Speed Networking Nights – and the new position would provide those programs with additional support, according to the job posting. This new rush of hiring contrasts with previous statements about hiring in the fundraising office: Collins said in February that the office’s hiring was “leveling off.” But experts say that turnover in development offices near the end of campaigns means that University officials are looking beyond the campaign’s finale. Collins said even after the campaign’s completion in June 2018, attracting donations will still be a priority. “When the Making History campaign concludes, it does not mean our outreach and fundraising work is complete,” Collins said. The campaign has raised more than $875 million on its way to a $1 billion goal. Richard Allen Ammons, a senior consultant at the fundraising firm Marts & Lundy, said that new hires show that officials prioritize long-term fundraising. Fresh faces in the office can make the campaign more effective and motivate staff in the long-run, he said. Gregg Carlson, a managing partner at the Carlson Group, said that while a university’s development office may have staffed up at the beginning of the campaign, it’s likely that some employees leave as the campaign closes. Arthur Criscillis, a managing partner at fundraising firm Alexander Haas, said as a campaign nears its end, development officers may start seeking out career advancement opportunities at other universities – particularly at those that are launching campaigns. Criscillis said because GW has successfully met its fundraising benchmarks over the past few years, the employees who helped the University reach this point are considered top prospects at other institutions. Cort Carlson, Meredith Roaten and Avery Anapol contributed reporting.